Mugsy the cat is not a very brainy cat. 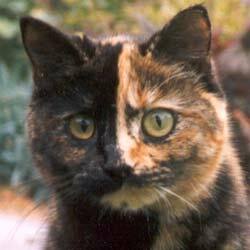 Her face is coloured half and half like a mask - one half is black, one half is orange. She is very little for an adult cat, and loves being carried. She is a shoulder cat, happy to sit on shoulders for hours. Mugsy is named after Mugsy Bogues, one of the NBA basketball's smallest players. Her name suits her, as she must be one of the world's smallest cats. Before we moved to the country Mugsy had a serious accident. When she was only seven months old she was hit by a car and left on the road for dead. The local vet on his way home with the family fish and chips drove past her, stopped, rescued her and rushed her to intensive care in his surgery. That first night he took her home and got up to check her every four hours. He didn't expect her to make it. Even days later he had grave doubts, and thought she would be totally blind if she did survive. But Mugsy the cat did survive. Then there was great excitement in the surgery when one of her eyes responded. From that moment she began slowly to recover, but I was warned that there was some brain damage. Mugsy's personality would be greatly changed. She took many months to re-learn all the cat-things most cats take for granted (e.g. how to co-ordinate back legs with front, how to smooch humans). When she first relearnt how to climb she would get terribly lost - she couldn't find her way home. Having no sense of taste, Mugsy is a fiend in the kitchen. Tomatoes, bananas and garlic cloves are considered consumables. Her trademark teeth marks have graced many a tomato. Mushrooms are also favourites. Mugsy tries to sense food by its texture. She can spend hours outside the glass doors at night trying unsuccessfully to catch moths. Her only hunting catch ever recorded is a duckling (already dead), which she seemed rather puzzled by. Mugsy gets nervous when she's too far away from the house, and runs back to safety, bouncing through the grass. She is not happy being taken over the water race. 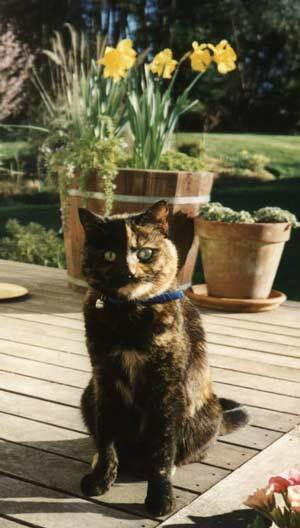 When we first came to live here she almost got seriously lost, and so she had to wear a cat collar with the name tag 'Mugsy, disabled cat'. Her partial deafness has affected her sense of direction, If she can't see me when I call her she sometimes runs off at the wrong angle. I have to make grand waving gestures to be properly seen, then she gets her bearings and bounces over. As far as cat company goes, Mugsy is good value when I'm inside the house. I sit down to watch the cricket on TV and she's right there sitting on my lap. I talk to her a lot at such times, telling her that I love her 'one thousand dollars worth'. I can never forget how she battled to live. She's been worth every cheque I had to write. We still take the animals to the vet who saved her those years ago, happy to make the hour long drive. A huge thanks to Andrew at the Redcliffs Animal Centre for looking after all the animals at Mooseys. Sad news - we possibly say goodbye to Mugsy the little battler cat - with 'hugs and hisses from the other cats and a nosy smooch from the dog'. False Alarm! Mugsy is Back! Mugsy was missing in the winter rains for nearly three weeks - then she was happily returned, found by a neighbour a long way from home. Phew! After a few more of these false alarms Mugsy finally passed away in January 2010. What a grand nine lives she had - our dear little orange and black cat. She now has her own memorial tree - a Black Boy peach.